Alfred A. Knopf (New York, 2014). 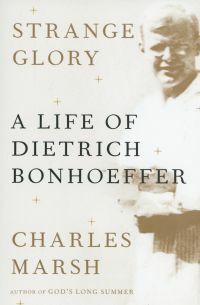 In “Strange Glory,” Charles Marsh has written a definitive biography of Dietrich Bonhoeffer, one of the most inspiring Christian minds of the 20th century. Based on extensive current research, the author presents a readable, engaging and well-documented account of the life of this renowned, complex theologian, a Lutheran pastor in Germany who became an anti-Hitler conspirator. Bonhoeffer came from an elite, wealthy family that fostered creativity in the eight children through the love of music, sport, literature, nature and celebration. Dietrich broadened his interests further by a year of college study in Rome. Having decided at a young age to be a theologian, his first assignment in ministry was as an assistant pastor in Barcelona, Spain. Although Bonhoeffer inherited “an unobtrusive wealth and an uninhibited taste for pleasure,” Marsh points out how deeply he valued spirituality and theology. While in Barcelona, Bonhoeffer describes the wealthy church youth group he worked with as “a merry band of lazy bones.” On the other hand, he considered the “questionable,” marginalized people who sought his counsel there to be interesting and authentic. Travels to Tripoli in North Africa and to America, London, Denmark, Cuba and Sweden later expanded his spiritual awareness. In America, Bonhoeffer also saw contradictions, describing the Protestant Church here as “I-centric” and as “claiming the right to forgo suffering and live their faith in freedom without a struggle.” A virtuous person here was synonymous with “a good fellow,” he said. America boasted of peace and brotherhood, but practiced and legislated racial discrimination. He was most impressed by the black churches, where he found joy in worship and “real religion” among the oppressed. Marsh reveals that Bonhoeffer believed there to be two types of Christians. The first kind concentrate on heaven’s future glory, lose the objectivity of the present moment and “stumble over the here and now.” A preoccupation with personal sin leads them into immobilizing feelings of guilt and fear. Their emphasis is on rules, concepts and moral perfection, leading to individual salvation. Underlying these values is the lie that “I am the only one here, the center of the universe.” Bonhoeffer refers to “so many horrors” throughout history caused by Christians who “turned their eyes upward,” abandoning the narrow way for a ladder of supposed ascent. The second type of Christian lives in the present moment, realizing that the difficulties and tasks of this world must be faced, and therefore “drinks the earthly cup to the dregs.” In this view, which was Bonhoeffer’s, the kingdom of God is found in relationships with others, reflecting the “enigmatic, impenetrable thou.” Christ, the center of reality, exists in community and concreteness. The Sermon on the Mount and Christology eventually became the focus of Bonhoeffer’s thought, with the result that he chose to be a pastor first, a theologian second. He became a major dissident voice raised against the anti-Christian rule of the Nazis, for which he was imprisoned and executed. Following God’s mysterious plan, Bonhoeffer found himself in an “inescapable paradox,” caught in the tension between his nonviolent stance and a responsibility to support the conspiracy to combat genocide, working simultaneously with the international church and as a Nazi spy.